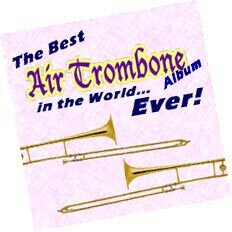 The Best Air Trombone Album in the World...Ever! Twiddle your rotary valves, extrude your slides and hang on to your bell rim as you listen to these classic trombone anthems. Old Blue Eyes gives his interpretation of classic songs, both old and new, and makes a much better job of them than the original artists. And anyone who doesn't agree is gonna get whacked. Featuring the runners up from the hit show. Ten classic tracks of woolly, bleating nonsense that all sound exactly the same. You see, it's satire really. Yes? A blazing session from the mixmaster, captured live at the Halitosis Club last June, which highlights Crosby's trademark fusion of Underground Skank, Industrial Fridge, Plank Beats and Golf. Relax with all your favourite Pan Pipe classics, played by the University of Arizona Steel Band. 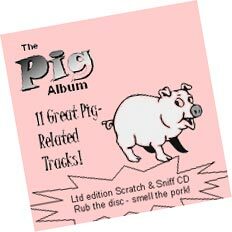 Porker's classic 1961 Album. Includes 3 previously unreleased bonus tracks: 'Rubbing it the Wrong Way', 'Swamp Squits' and 'She's Buried Under the Chicken Coop'. Featuring guest appearances from that guy who used to be in East 17, the blonde one from Busted, and Bjork on bongos. Includes 'Rattling a Door Handle', 'Stomping Through Gravel' and a special extended version of 'Banging Two Horses Together to Simulate the Sound of Coconuts'. A division of Amalgamated Offal Products Ltd.